I work as a Social Director for a country club community in Florida, and one of my jobs is to do event planning for them. 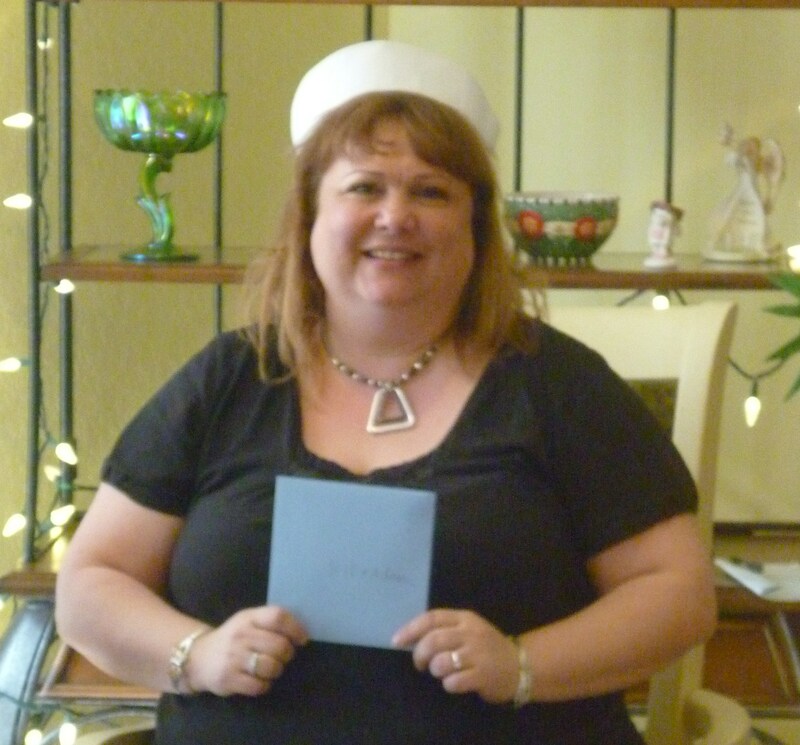 I love doing it, and I had the opportunity to create a special bridal shower r for my sister Jill, who will be marrying her intended, Adam, on April 22nd in a cruise ship wedding. 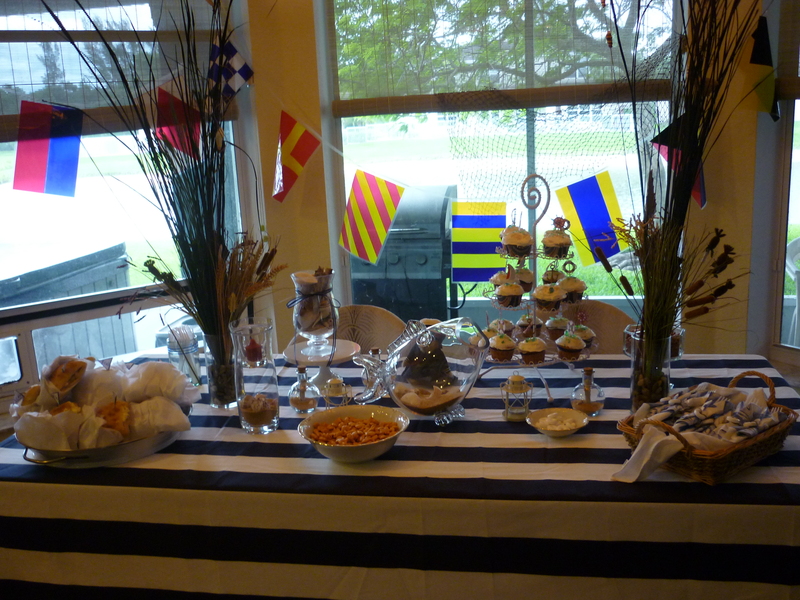 Befitting of the upcoming event, I did a nautical theme to celebrate with friends and family. After all these years of creating events for other people, how wonderful that I had the chance to do this for my sister! 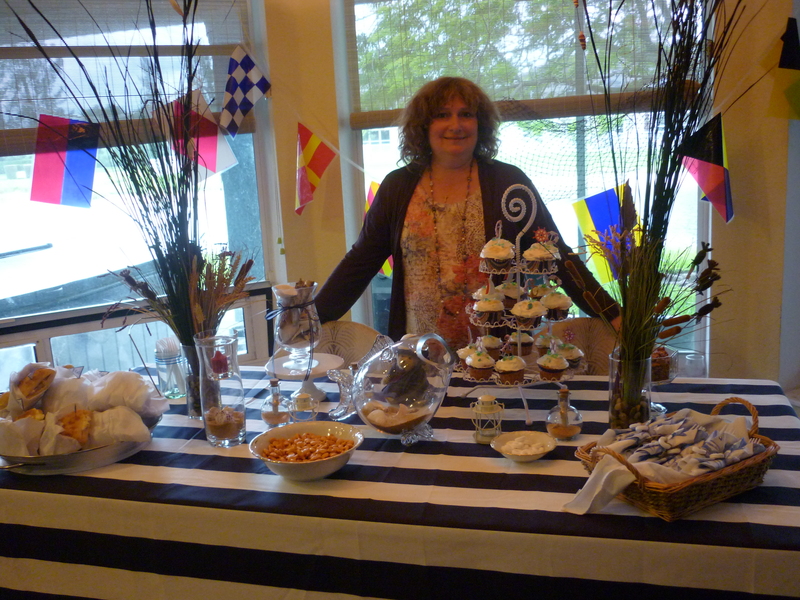 I started with a blue and white piece of fabric, ordered online that became the table cloth. It was a durable canvas material and I plan to finish off the edges to make this a “real” tablecloth. 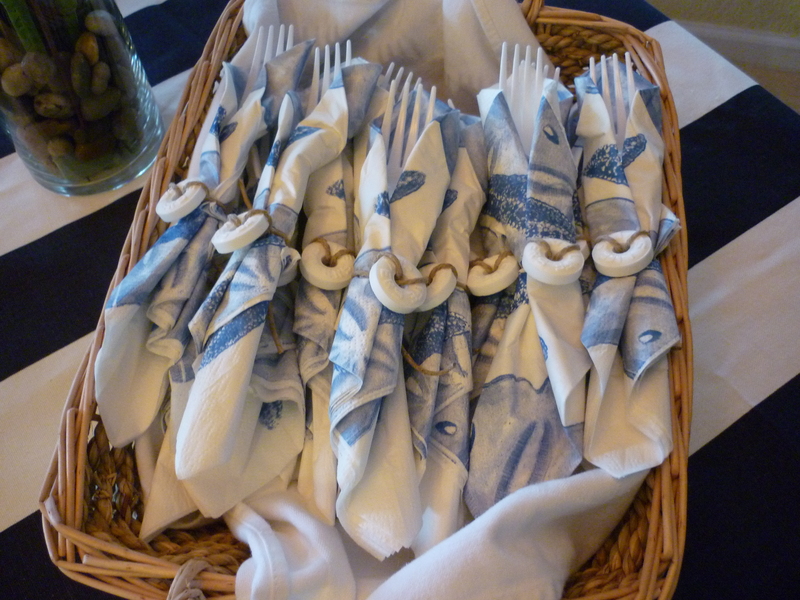 Details, details… next came a basket of cutlery wrapped with a napkin, some twine and a lifesaver candy. 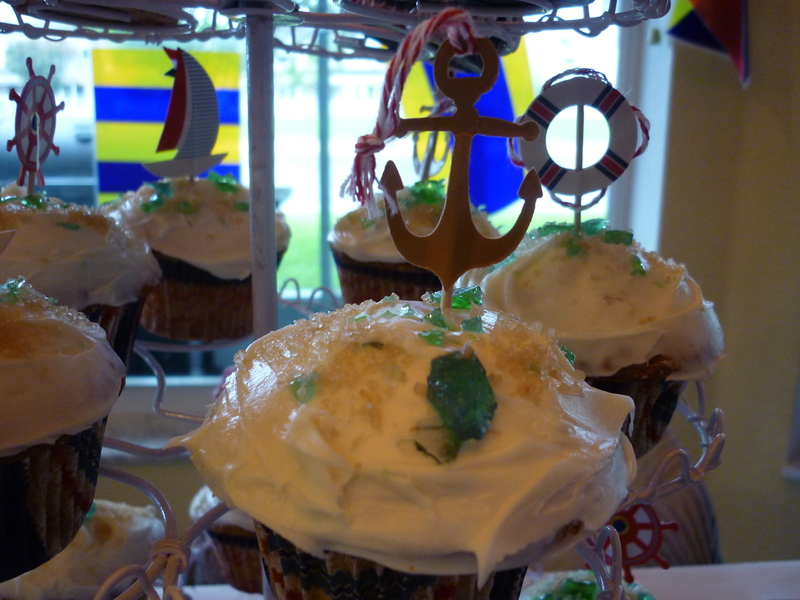 My daughter Lacey and niece Noelle helped with the nautical cupcakes. They were so pretty! 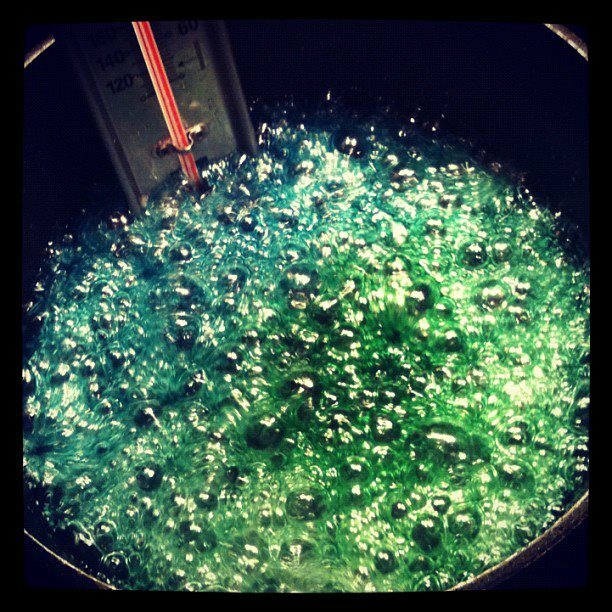 We decided to make edible sea glass to sprinkle on top along with some raw sugar for a “sand” effect. 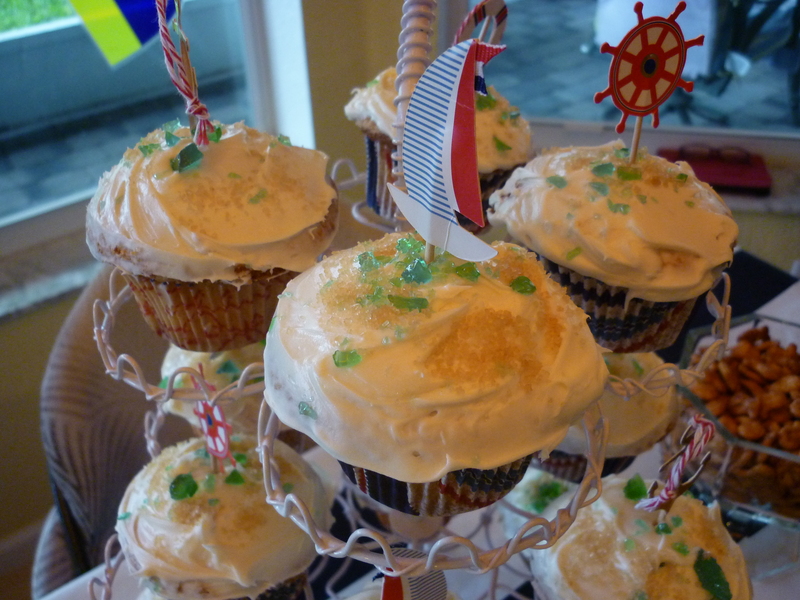 They were vanilla with a touch of orange, and a cream cheese frosting. 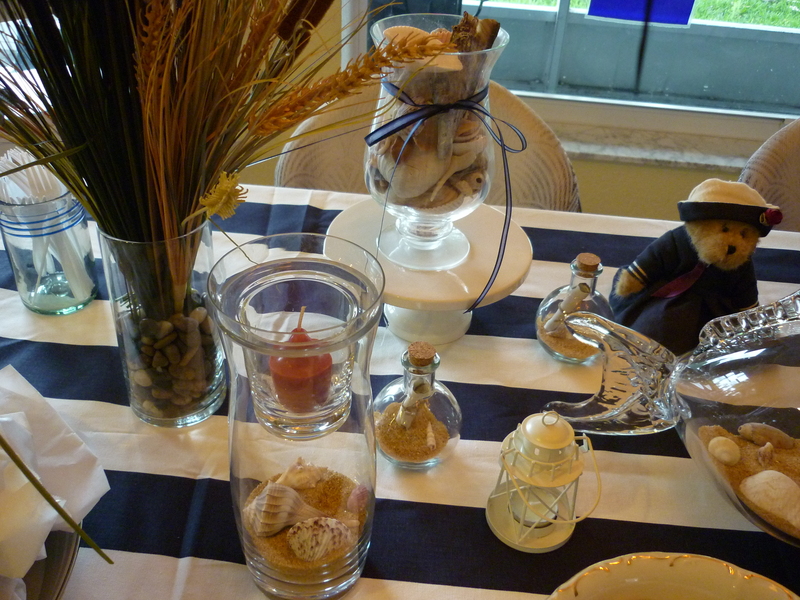 More decorations included 3 little “messages in a bottle”. These little lighthouses were so pretty! They held tea lights which gave off a pretty glow when lit. Just the right touch. 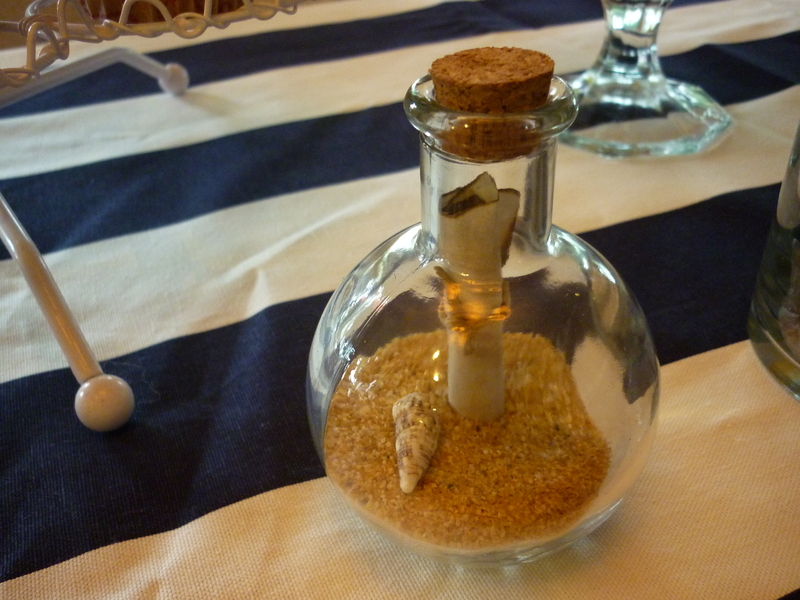 I filled glass vases with seashells I had gathered from Sanibel Island. For snacking, I had a couple of bowls of goldfish crackers, and of course the appetizers were shrimp puffs, made by my mother. This big glass fish bottle was filled with “messages” written out by the guests. The messages were marital advice for the bride. 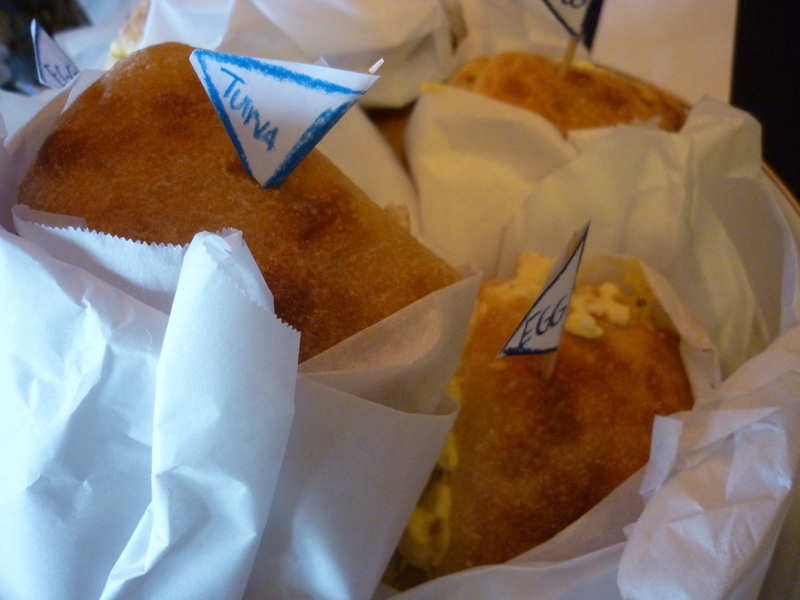 Also offered were wrapped Tuna, Egg & Chicken sandwiches with little nautical flags identifying the type of sandwich to choose. 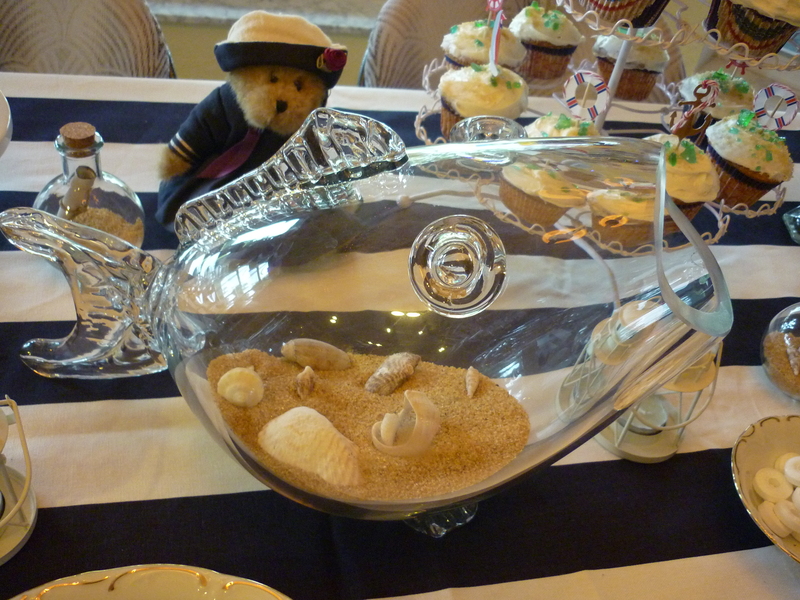 And who could forget the Nautical champagne punch? Beautiful blue like the sea with frothing water…AND it was delicious! All in all, a successful bridal shower for my sister Jill. She loved it! Happy Wedding Jill! Bon Voyage! Mark, Lacey & I can’t wait to sail off with you and Adam after the cruise ship wedding. 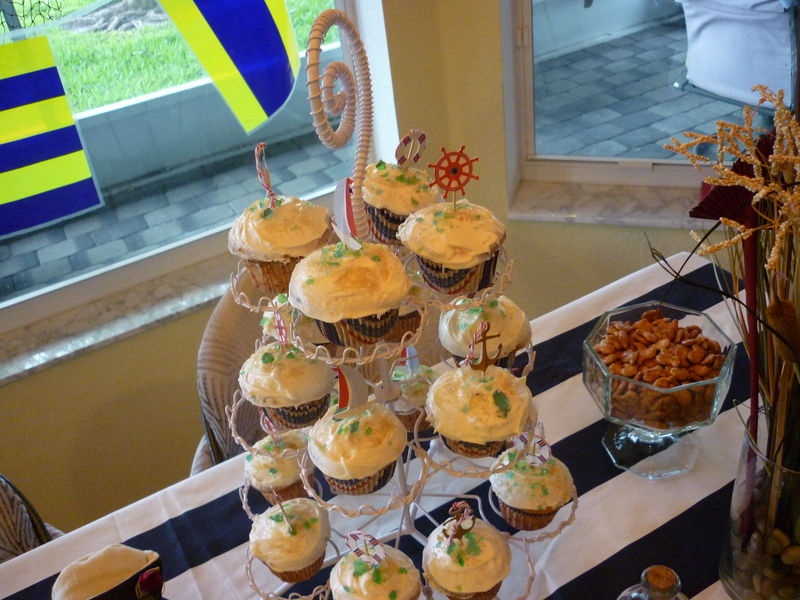 This entry was posted in Life and Times and tagged Bridal shower, Bride, Cooking, event planning, Relationships, Weddings. Bookmark the permalink. Your sister has a **fabulous** sister; well done! How did u make the champagne punch? 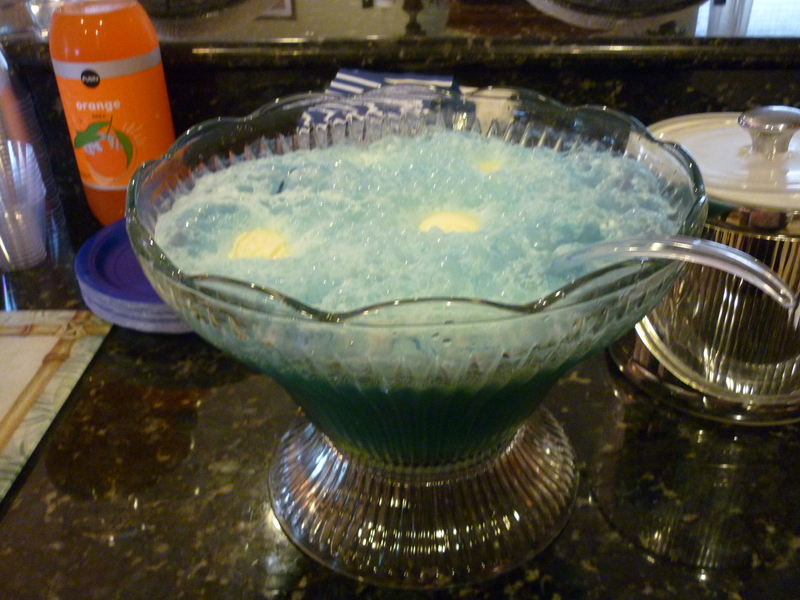 I used a box of unsweetened blue kool-ade powdered drink mix, 1 bottle of lemon-lime soda, 1 bottle of white cranberry juice, 1/2 bottle of champagne and scoops of vanilla ice cream to make the “foam”. Just mix it all and add the ice cream last. 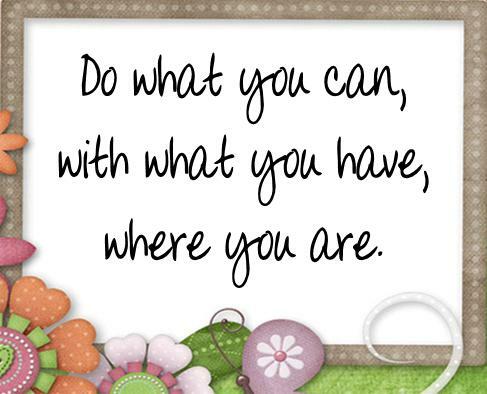 Also, add a bit of sugar if you want it sweeter. If you want non-alcoholic, substitute Seltzer for the Champagne. How big is the bottle of lemon-lime soda and white cranberry juice? Also how big is the kool-aide packet?